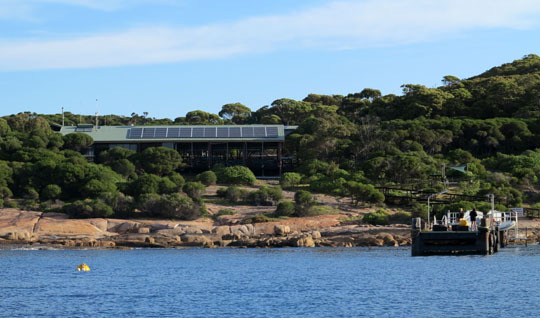 My third Western Australia island excursion for my forthcoming National Library of Australia book Australia’s Islands took me to the town of Esperance and out into the Recherche Archipelago. That very French name came from Bruni D’Entrecasteaux who encountered the islands in 1792 and named the group after his ship Recherche. The town takes its name from his second ship, the Espérance. One island in particular has become very well known of late – Middle Island with its bubblegum pink Lake Hillier – because of a dramatic short YouTube clip from Red Bull with a wing-suited madman flying down over the lake and landing on Belinda Beach. That doesn’t mean the island has suddenly become crowded, it’s only 10km off the coast, but it’s 120km along the coast from Esperance, the nearest town, so getting a boat out is a big trip. Aircraft can’t land on the island although helicopter trips are possible, if there’s a chopper available in Esperance. ▲ Middle Island from 35,000 feet. There are flightseeing trips every day – check the GAS – Goldfields Air Services – website for more information. My plan was to see the island from the air one day and then go out there by boat the next. Unfortunately the weather decided not to cooperate and my flight was cancelled. Never mind I still managed to see the island and its pink lake from the air, I spotted it from my Qantas flight heading back to Melbourne from Perth at the end of my islands foray. From 35,000 feet instead of a few hundred metres, but I did see it! 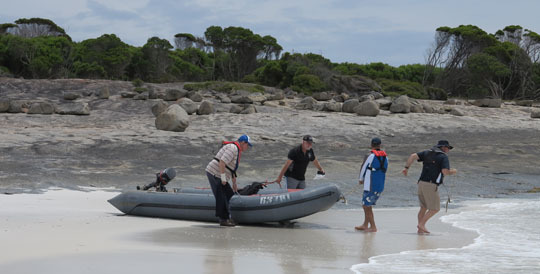 ▲ The next day our boat – from Black Jack Charters – departed Esperance at 5am and we landed (from an inflatable launched from our larger boat) on Belinda Beach five hours later. That’s the same beach that Red Bull Wingsuiter parachuted onto. We had a few hours on the island to look around, although ideally I’d liked to have spent a night there and climbed Flinders Peak the next day. ◄ Yes, it’s named after pioneering explorer Matthew Flinders who stopped by and discovered that colourful lake in 1802 during his circumnavigation of Australia. 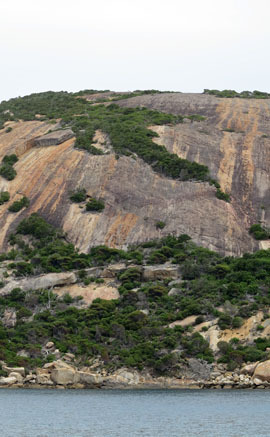 From 1825 Middle Island was the home base for Australia’s only recorded pirate, Black Jack Anderson. He harassed passing ships until eventually he was killed by his own men. The group stretches over 200km east-west and comprises 105 islands and over 1,000 islets, reefs, shoals and other obstacles to shipping. 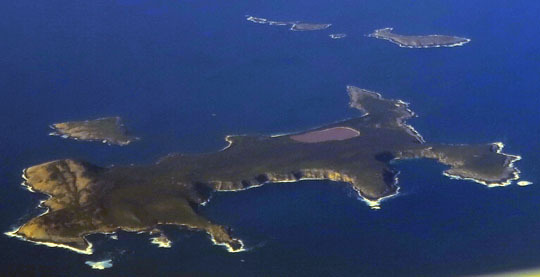 Flinders had described the islands as ‘an extensive mass of dangers’, as many vessels have discovered over the centuries. As recently as 1991, the Sanko Harvest, en route from Florida via the Panama Canal, struck a reef near Hood Island only 30km from Esperance, its final destination. Within a few days, the bulk carrier had broken up and its cargo of 30,000 tonnes of fertiliser was washed away. Today it’s the largest wreck dive site off Australia and the second largest anywhere in the world. Most of the islands would be very difficult to land on and only one of them is inhabited. 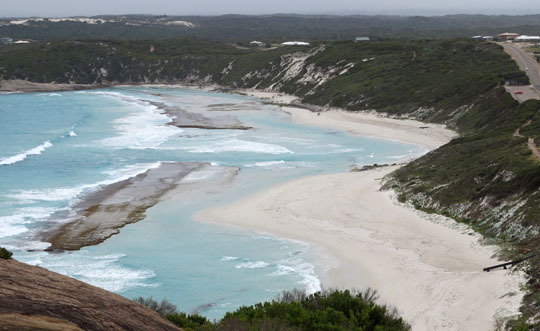 Woody Island is only 15km from Esperance and has a small eco-resort. You can stay on the island or it’s a popular daytrip from the town. ▲West Beach, Esperance – it’s hard to imagine a prettier beach than Belinda Beach on Middle Island but Esperance itself has a bunch of excellent beaches and since we didn’t get to fly out to Middle Island there was time to drive the 40km Great Ocean Drive circuit of the town and check all the town beaches. There are lots more further afield. ▲ There was also time to check Esperance’s excellent museum. It’s full of all sorts of memorabilia, much of it just junk, but truly wonderful junk! There are also assorted bits and pieces from Skylab which crashed to earth in WA, narrowly missing Esperance, in 1979. 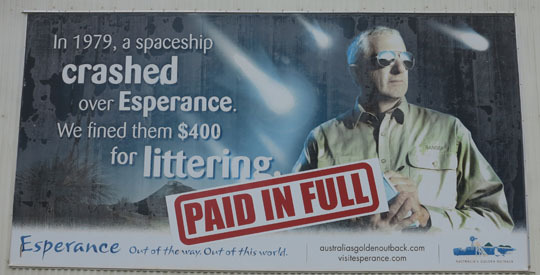 The Esperance council slapped a $400 littering fine on NASA. They never paid up, but a US radio station passed the hat around, collected the penalty money and paid it on behalf of NASA.